Holiday Giveaway Number 2! I had some challenges earlier with posting (completely user error! ), so here goes again. Click the "Read More" link at the bottom to access the Rafflecopter entry form. 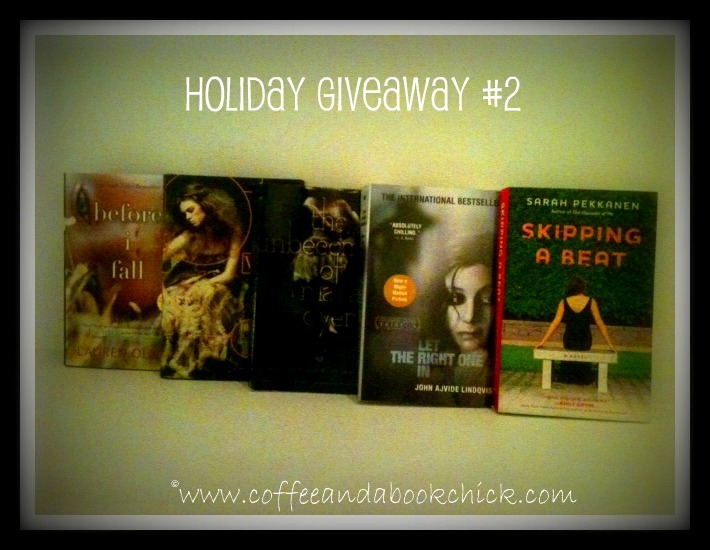 Here are the books that you can win! Click on the "Read More" link at the bottom of this post to get to the Rafflecopter entry form. Rafflecopter seems pretty simple to enter your details. You can either login with Facebook, or login with an email address. Then, click on the +1 to enter your name, and then the next +1 to enter your email address. If you win, I'll connect with you to get your mailing address. What a great giveaway! I am not going to enter, as I have all of these books, but I do wish a lot of luck to all your entrants and am amazed by your generosity! Ahhh, I want to read Wither really bad! I have a couple of these books, but I like having doubles for my classroom! Monique - If you clicked on the Post Title, it should bring you directly to only this post and you shouldn't see any other previous posts, and that should then show you the actual Rafflecopter widget. It sounds like you were able to enter your information in, so you should be good to go. Thanks, and apologies to all if there are any issues! Yay for books! I didn't get any (!!!) for Christmas so I'm trying here. Thanks! Trying to enter cuz I like your gift giving spirit and there are some readda that caught my eye. This is a fantastic giveaway, Natalie! Thank you! I haven't read any of these books yet! Tried to enter, but the form wasn't working correctly. Samantha Cummings (samantha@pricelesswriters.com) Thanks so much for the opportunity! Rhonda and Samantha - Looks like you registered just fine, thanks! Rafflecopter selected (via random.org) the winner: Wendy, entry #23! Congratulations! An email has been sent out to request the mailing address and once received, the package will go in the mail this week! CONGRATULATIONS, WENDY! HAPPY READING! Thank you Natalie!! What a nice suprise. Have a great week!